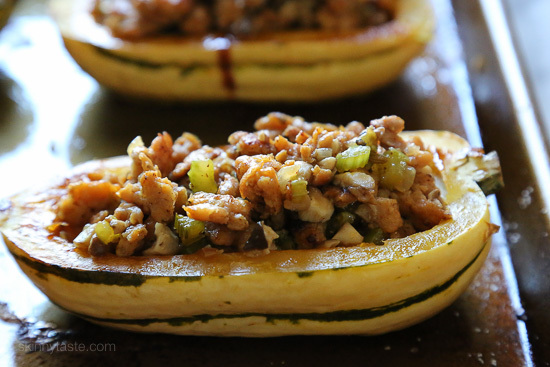 Delicata is very versatile, one of my favorite ways to eat it is stuffed with a savory sausage stuffing made with celery, onion and mushrooms – a wonderful contrast to the sweet flavor of the squash. I’m so excited to see delicata squash is finally in season, also known as “sweet potato squash” for its brown sugar flavor which tastes similar to acorn or butternut squash. It’s high in beta-carotene and vitamin C, relatively low in calories. One half is satisfying if served with a salad or side, or simply enjoy two. Spray the cut sides of the squash with oil and sprinkle with salt. Place face down on a large baking sheet. Bake until tender and browned on the edges, about 20 to 25 minutes. Meanwhile, in a large saute pan cook sausage on medium heat, breaking up the meat into small pieces as it cooks until the sausage is cooked through and is browned. Add the onion and celery; cook until celery is soft, about 8 to 10 minutes. Add the mushrooms and thyme to the pan, more salt and pepper if needed and cook, stirring 5 minutes, then cook covered for 2 minutes, or until the mushrooms are soft and cooked through. 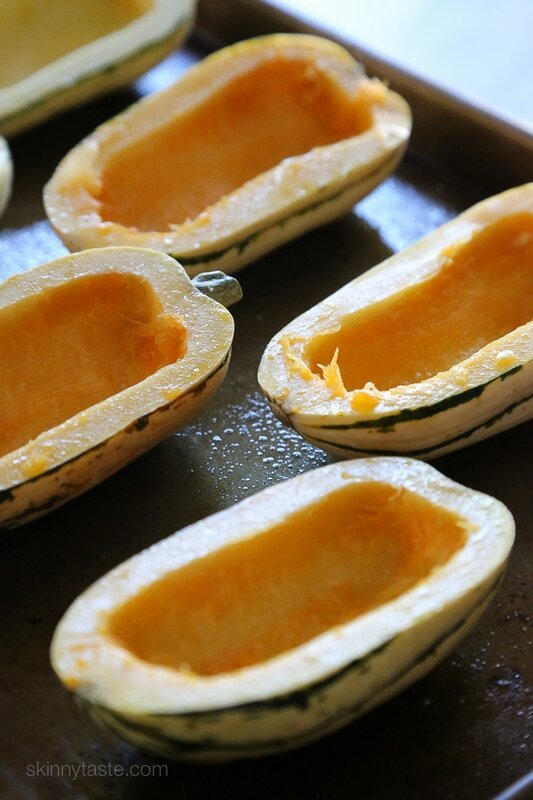 Divide (1/2 cup) between the squash, top with parmesan cheese and bake 10 minutes. Just added a nice glug of marsala wine to the sausage filling…everything smells so good right now! GINA GINA GINA!!!!! Okay, so I’ve made tons of your recipes and there hasn’t been a single one that I can recall that I disliked. Some obviously I love more than others because people have different taste, but I always enjoy them. But this!!!!! I made this tonight and I just can’t believe how much I loved it!!!! I can’t believe the flavor from so few ingredients. Tastes so gourmet to me. I’m relatively new to weight watchers. I don’t have tons to lose… 15 to be comfortable (squashed it) and 30 to be at goal. But honestly? It hasn’t been painful, with much thanks to you for that. So many things feel like a cheat. Thank you so much. I know you’ve heard it all before! Delicata squash is a favorite. I love them! Love being able to eat the whole thing. The sausage I use is a chicken one from Biliniski 90 calorie per link., and they come in 12 oz packs of 5. My husband said it was like a thanksgiving dinner and we loved it. Thank you for another favorite. WOW! These are delicious!!!! I made it with Turkey Sausage and ground thyme because that’s what I had. I’m having one for lunch and it’s so good, I may have another for dinner! Thanks you!!!! I have made this many times and we are having it again tonite. It is one of my favorite, go-to recipes! It is delicious leftover as well. Thank you for the recipe link to make homemade turkey sausage, which will make it easier to make this more often. Just made this for our family after seeing the delicata squash at Trader Joe’s. Absolutely delicious and SO easy!!! We both said it tastes like autumn in your mouth. I cooked 100% according to directions and it was perfect. Thank you! do you need to cook the squash before slicing in half? they seem hard. I normally don’t but you can throw it in the microwave for about 5 minutes if you wish. Just made these and they were amazing! My first time trying delicata squash. I spotted them at Trader Joe’s and remembered seeing this recipe so I had to get them. No grocery store had fresh thyme so I subbed with a sprig of rosemary and it was still great. The skin falls off pretty easy when eating so if you don’t like the texture it’s not a big deal. This is delicious. I like it so much I made sure to plant some sage in the garden this year. I’ve also made the stuffing for acorn squash as well. This recipe is posted as 5 points. I used the WW calculator and it comes out to 8 points. Were these calculations from an older WW plan? The nutrition Information lists that this recipe has 30.5 g of Carbs, could this be a mistake which would make the SP value higher? If not I can’t figure out where all the carbs are coming from in this recipe. 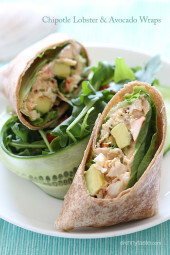 As with all your recipes this was fantastic…super easy, nutritious and low fat/carb. I used baby bella’s because I had them and served over spaghetti squash. I made this tonight. Found the squash at Trader Joe’s and had to use turkey sausage instead of chicken since I couldn’t find chicken sausage. It was amazing. I can’t wait for the leftovers. This is seriously so good! Definitely will be a staple in my house going forward, just like your Santa Fe stuffed peppers! Thanks! This is so delicious and easy to make! We have had it twice this week and I love it leftover as well. I enjoy your site. 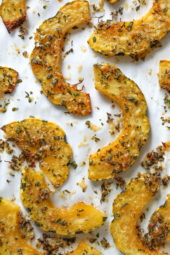 We’ve been eating Delicata squash for several years and are always looking for new ways to prepare it. I was so excited to see you had posted two recipes. We tried this one and love it. Both of my little ones loved it and the 5 year old asked to have it again. Thank you so much for sharing this. Delicata will be going in the garden agiain! I made this tonight with a few modifications to use what I had on hand. I cut the servings to 4 since I only had 2 squash, and used turkey breakfast sausage because that was what I had in the freezer. It was great! Hubby loved it. I think it was meant as a main dish, but I actually served it as a side with a lean pork roast and some green beans. It would make a wonderful main dish though! Don’t be afraid to try this one!!! I wanted to let you know that I just put this recipe into the Official W W recipe builder and using 1 lb of Insernos chicken sausage , it only came to 2 SP per half! I made this dish with butternut squash and turkey sausage (I couldn’t find chicken sausage). It was delicious!! I’ll definitely be making it again, it’s a wonderful fall recipe. Made this tonight and it was delicious. But I am not sure what I did wrong to the delicata. They came out of the oven really floppy the first time, seemed to firm up a little once I added the filling and baked again. I made delicata a lot, but usually sliced up small and roasted. Despite the texture issues, was still a big hit! Ok so I made this a few nights ago and it was a home run with the entire fam! 3 year old and 11 month old!! I’ve already got another batch of ingredients cause hubs can’t wait for me to make it again! Made this for dinner this evening. It was delicious. I used sweet Italian turkey sausage and button mushrooms. Husband and I really enjoyed it. Fantastic!! I grilled the squash on our charcoal BBQ and it was simply wonderful! Used Thin&Trim chicken sausage (garden vegetable), otherwise the same as recipe. Beautiful presentation, and could easily see cooking everything ahead of time and reheating after assembly. One of my favorites!! Gina, how do you remove the sausage from the casing? I made this last night with butternut squash it was delicious! I just had to add more time to cook the squash. Thanks so much will definitely make this again! I could not find Delicata so I tried Acorn and Butternut; I preferred the Butternut. I added a little sage to the meat mixture and thought the dish was absolutely delicious! I made this exactly as written. It was my first time w/this type squash. I liked the dish,however I would do a few things differently next time. I would pierce a couple of slits in the squash and nuke it for a few secs. to make it easier to cut through. Then I would proceed as written. I think I’d like to try it w/another type squash as well,and even change to ground chicken,and a less expensive mushroom…wow $8.95 per lb. for those mushrooms,so I had to cut it back. I love what you do in the kitchen Gina,it brings us so many different flavors that we wouldn’t normally try. It also helps w/confidence to ‘play’ w/a recipe a little,and not be afraid to ‘mix’ it up a bit w/the ingredients. No fear, it’s all a learning process. Blessings. I just made this. OMG this is so good!!!! 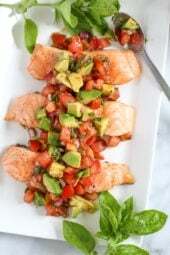 Hi Gina, thanks so much for the amazing recipes — your blog is my go-to for dinner ideas! Is there a brand of sausage you recommend?? Thanks! Thank you for the glutenfree recipes with smart points. Perhaps you will be publishing a cookbook specifically for this need. Made this last night and it got rave reviews…. LOVED it. Can these be stuffed and then frozen? Made this tonight….soooo good, especially as the weather is finally turning to fall and could have the oven on. Highly recommend! Gina, can you tell me where to find a healthy uncooked Italian chicken sausage? I know you like the Al Fresco brand but I can only find the precooked, pork encased chicken sausages. Do you have a suggestion for just making the sausage yourself? I don’t know if you live near a Sprouts Grocery Store but they sell a ton of different flavored fresh, uncooked chicken sausages. Was calculating the SP and didn’t see any amount after saturated fat listing. Also, it came up with 6 SP. which is right? I use Weight Watchers recipe builder to input all the ingredients, the only way to accurately get Smart Points. The calculator is often wrong because fruit and veggies are 0 but not if you use the calculator. 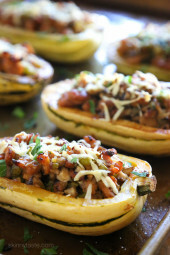 Delicata is my favorite type of squash so I was excited to see this recipe. I made it and it was huge hit with everyone. It will also make a great side dish for Thanksgiving. This was delicious! A few variations, in case this helps anyone: my daughter doesn’t eat meat so I made hers with tofu. My son doesn’t like squash so I stuffed his in a red pepper. All of this worked fine. Also, I didn’t have sausage but had ground turkey I needed to use up, so I used that instead and just added a lot of seasoning. Still delicious!! That delicata squash is amazing. Thanks for the tips! We don’t eat meat either. 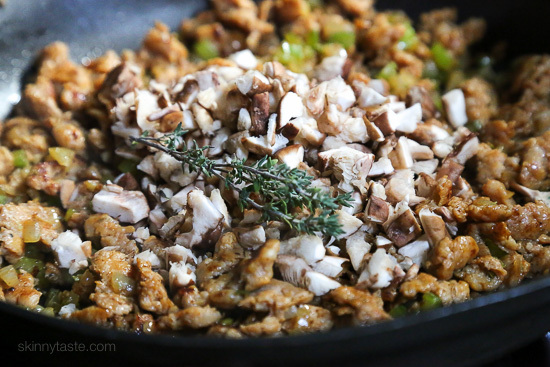 How did you prepare the tofu, crumbled like hamburger meat or diced and fried? I’m curious, thanks! This is delicious! !! I made an entire recipe of the stuffing, but since I am only feeding myself, roasted only one squash. I plan to freeze the rest of the stuffing for future use. Also am a newbie to delicata squash, thanks for introducing me to this awesome veggie. Just made this tonight using butternut squash. Delicious! Thank you! This is so good!! Me and my husband devoured it. Thanks Gina ? I made this tonight for dinner and it was really good. I did use vegan mozzarella shreds instead of Parmesan to keep it non-dairy. I made this last night, & it was delicious & so easy! My grocery store didn’t have delicata squash yet so I tried 1 acorn & 1 butternut, & they both worked great. My grocery store also has pre-cooked packaged chicken meatballs. I got the pineapple bacon flavored ones & just stuck them in the microwave for a minute & threw them in my little chopper & added to the pan. It was a breeze, & I think the flavored “sausage” really took them over the top. SO good! Made this tonight and it was delicious! I think the delicata squash really make the dish. I made this tonight for dinner and it was delicious! Even my husband liked it and he’s not much of a squash person! Thank you for another fabulous recipe! These look amazing & I can’t wait to make them tomorrow night. I was worried about finding these squash, and had decided that I would get Acorn if I couldn’t find them, then I walked into Stop & Shop and there they were! Looking forward to tomorrow night’s dinner. Thanks, Gina! Gina, in the instructions after it says to brown the sausage it says to add the oil but there’s no oil in the ingredient list except for oil spray to spray the squash before baking, how much oil if any? No oil needed, I changed it and forgot to delete. Thanks! This looks so so good! Saw you making it on snapchat and I was waiting for you to post it 😀 😀 😀 I will have to visit the farmer’s market soon and try finding delicata, because I don’t believe they have it in my grocery store (Southern California). Maybe I will look again this week. Thanks for the idea, I think I will make it with a butter lettuce salad…. yum. OMG ok this was so, so good. Thank you so much for helping me change it up and keep my diet interesting. This was quick to make and I am so pleased with how satisfied I was after one squash half and a side of rice pilaf. On a side note, I have to tell you that I found a rice pilaf with orzo (my favorite!) recipe on Allrecipes and made some super simple adjustments… aka cut the butter in half… to come out with a low calorie, filling side dish. My awareness of how much fat and sugar goes into my food is so much greater because of your recipes, and I am so grateful!! So glad you enjoyed this! I’ve been meaning to make a rice pilaf on my blog, love it. I am so happy you are learning how to modify recipes on your own. So true, once you start cooking the skinnytaste way, you start realizing how much excess fat goes into recipes and you really don’t need it. Super excited to found these squashes at Trader Joe’s. Trying to make this next week. Is there anything I can prep in advance for easy dinner ?? I would think you could cook the filling and leave it in the fridge until you want to bake the squash. Might give it a quick heat up since you really only put them back in the over to melt the cheese. I made the stuffing in advance. What is the green garnish shown in the first few pictures?….basil perhaps? Will add this recipe to my “Make soon” laptop file! Can you eat the skin like a zucchini or do you just scoop the meat out with the filling? This sounds tasty. You can eat the skin but I just scooped it out as it was a little crisp from roasting. Could I substitute acorn squash for the squash? 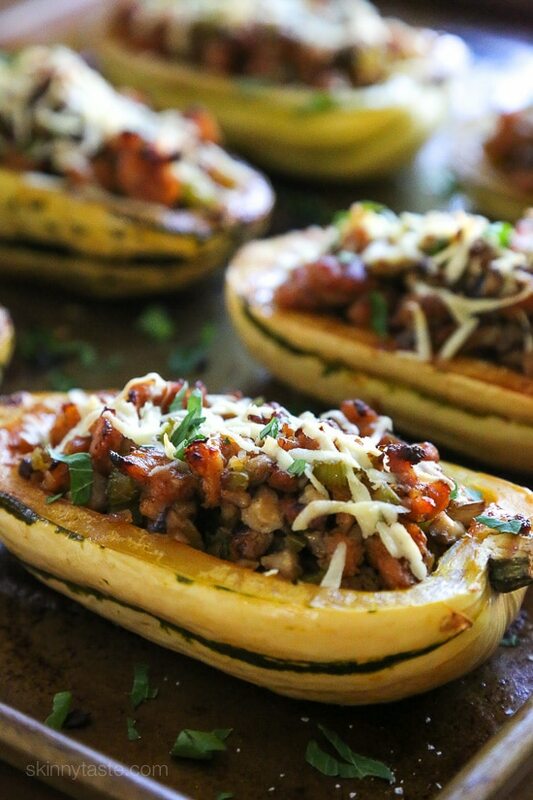 Love, love, love delicata squash. This looks great! Okay, made this last night and eating a leftover right now! I am in love. I used spicy chicken sausage as I don’t care for sweet and couldn’t find any thyme but it’s still AMAZING. In my grocery store, they have this squash around Halloween and it’s in a big box with many types of less popular squash and gourds. Hope that is helpful. Enjoy!!!! Not a big fan of Mushrooms what can I use to replace them? My husband doesn’t like mushrooms either, I used chopped zucchini! I’ve never heard of these! Can you find them at your typical Kroger-like grocery or is it more of a Whole Foods specialty item? 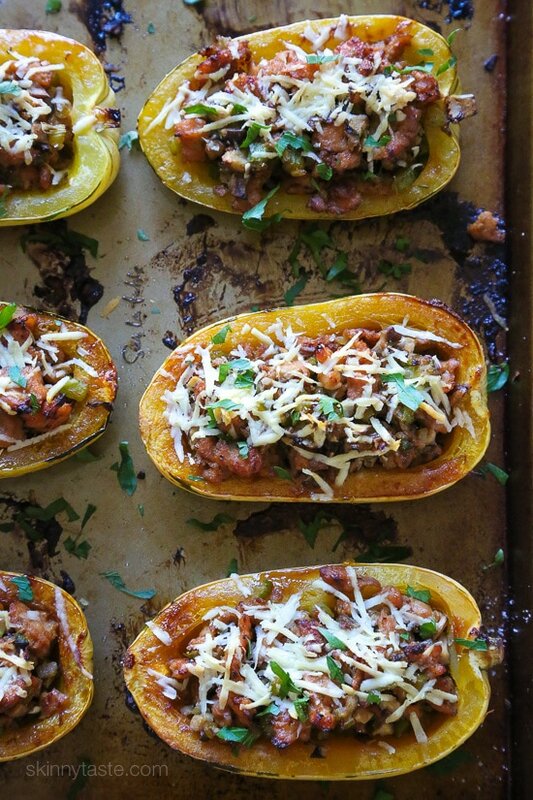 Looks delish – and also looks like it would work for spaghetti squash as well? I wondered the same thing! If I can’t find delicata squash, would acorn squash work too? 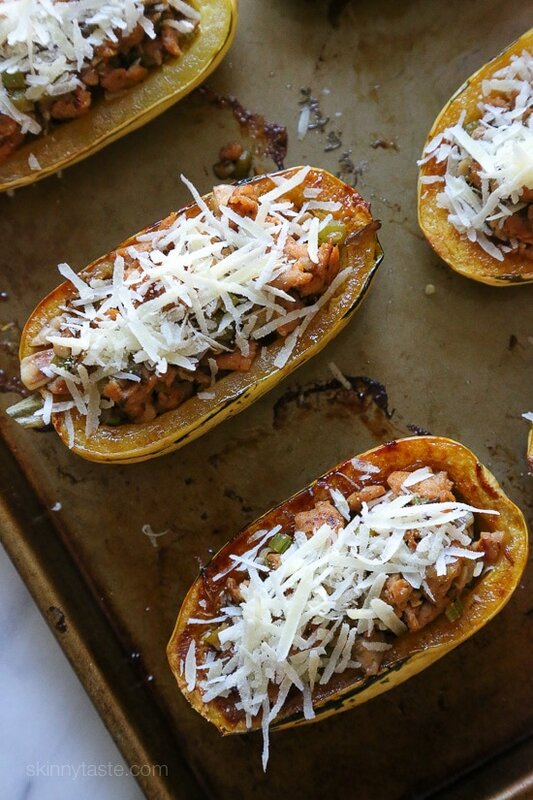 Would spaghetti squash work for the recipe as well? Curious what gives it so many carbs?? Is 30 correct? My local farm stand just started getting these in. This is going on the menu soon. Is there a different sort of squash that is comparable to delicata? I haven’t seen this type of squash in stores near me.